The people that I write about are all fictional. But I knew them all. I became a drug addict when I was forty –two. Up until that time I was a very successful dog trainer, song writer, and businessman. I tried cocaine a few times and was hooked. In the eight years that followed, I smoked cocaine day and night. I became helplessly addicted, as I went through three quarters of a million dollars. I became a pusher, and a smuggler. I lost touch with my children, and everyone who was decent in my life. The final three years of my existence I became homeless in New York City. Living on the streets I grew to know the many dregs of humanity. I was one of them, and I was an observer. The day I turned fifty I stopped. There are many more stories to tell, but these tragic lives will have to do for now. "Broken Flowers” comes from my heart. Parents be aware of what your children are doing, and never give up on them. Those of you who think you just want to experiment, beware. The experiment just might blow up in your face. And for those of you who are hooked, stop. Reach out for any help you can find, and fight the drug. You CAN get your life back. 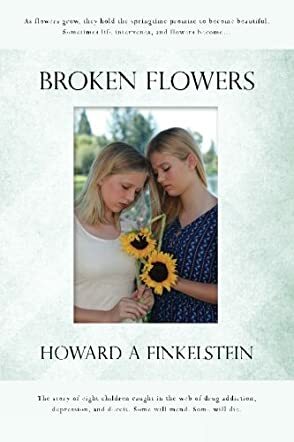 Broken Flowers by Howard Finkelstein is a short story about drug addictions and a broken promise. Dr. Mary Crawford is a psychotherapist who treats people with suicidal tendencies and drug addictions. When she loses a patient due to her selfishness, she unknowingly puts her own life at risk. In the beginning, Broken Flowers starts out really well with the overdose of Valerie Campel. It is not until chapter three that the author introduces the main character of the book, Dr. Mary Crawford. From there the story focuses on Dr. Crawford and the lives of two of her patients, Karl and David. I had mixed feelings about this book. I did enjoy that Dr. Crawford used hypnosis in her work. Hypnosis has always fascinated me and this story only increased my interest in it. I liked that Finkelstein told the other patients' stories in great detail as to how they became drug addicts and the consequences they suffered. I completely understood when Suzanne was talking about her depression. “Some days I feel better, and then some days the depression lays over me like a blanket.” I also very much liked the ending of the story. I believe everyone got what they deserved and I did not see the surprise ending coming. Overall, I think Broken Flowers is a good story. I would like to read more of Finkelstein’s work in the future.